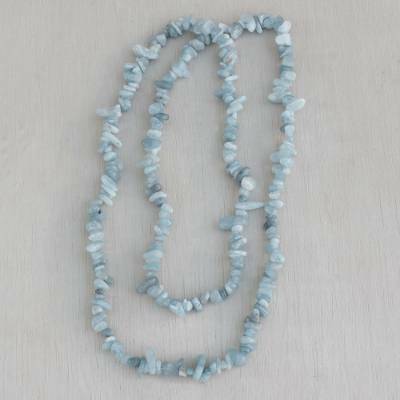 Natural Aquamarine Beaded Necklace from Brazil, "Aqua Infatuation"
Exhibiting watery blue colors, natural aquamarine stones are beaded along the length of this long necklace from Brazil. The artisans at Joias do Rio carefully select the stones to circle the neck with grace. You can find aquamarine beaded long necklace 'Aqua Infatuation' by Joias do Rio in jewelry categories such as Birthstone Necklaces, Aquamarine Necklaces and Long Necklaces. Enjoy exploring these sections for other Novica treasures. Purchased as a birthday gift for my new daughter-in-law. She loved it!!! Giving it to my sister for her birthday - aquamarine is her birthstone. I'm sure this is the first example of rough stones she will have, but I know she'll like it. This is a lovely necklace with many beautiful shades of aqua. This necklace is a very nice length and the color is lovely. I was afraid the stones would be rough, but they are very smooth and easy to wear. The necklace has a nice weight to it so it hangs beautifully without being bulky. A great wardrobe addition! Stones smaller than I expected. Will not disappoint. Perfect for layering. Color blue is soft. Milky blue. This necklace is absolutely BREATHTAKING! It is so well made. The colors are so beautiful too. The shades of blue are quite calming. I adore it. The designers at Joias do Rio find inspiration in nature's true beauty, as well as in the magnificence of Rio de Janeiro. One of humankind's earliest artistic expressions is that of wearing jewelry. From seeds, flowers and wood to metal and gemstones, jewelry symbolizes a culture's values and historic periods. Brazil's gemstone jewelry is renowned worldwide for the rich detailing that designers apply to their creations, as well as for the variety, quality and colors of the country's natural gemstones. The designers at Joias do Rio find inspiration in nature's true beauty, as well as in the magnificence of Rio de Janeiro. Their original designs showcase the infinite variety of colors and shapes of Brazilian gemstones. Through their association with Novica, these artisans would like to offer customers jewelry pieces that are at once delicate and exuberant. I bought these for my brother-in-law's mother for Christmas. Her eyes lit up, and she was so delighted with them that she kept thanking me. They are beautiful.